It’s been great having UpCycle Creative Reuse Center (CRC) in the neighborhood since they opened last summer. And we’re just so thrilled to feature UpCycle CRC today in our Eight Days of Del Ray Holiday Giveaway. Throughout the month of December, we’ve partnered with several members of the Del Ray Business Association to offer giveaways to our readers. Keep reading to find out how to enter! 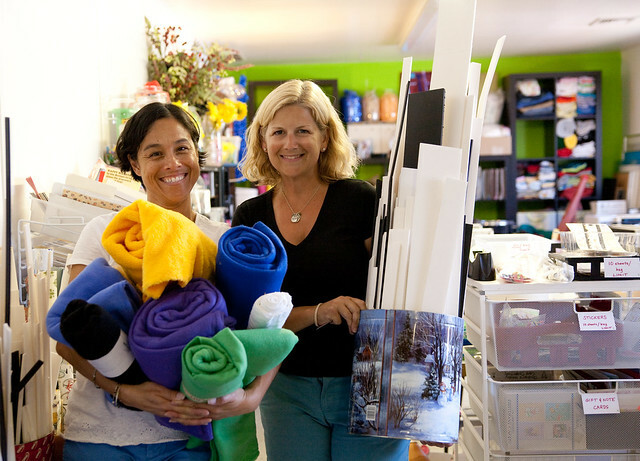 UpCycle CRC, founded by Susan Miranda and Kelley Organek, is a community resource in Del Ray located at 1712 Mt. Vernon Avenue. 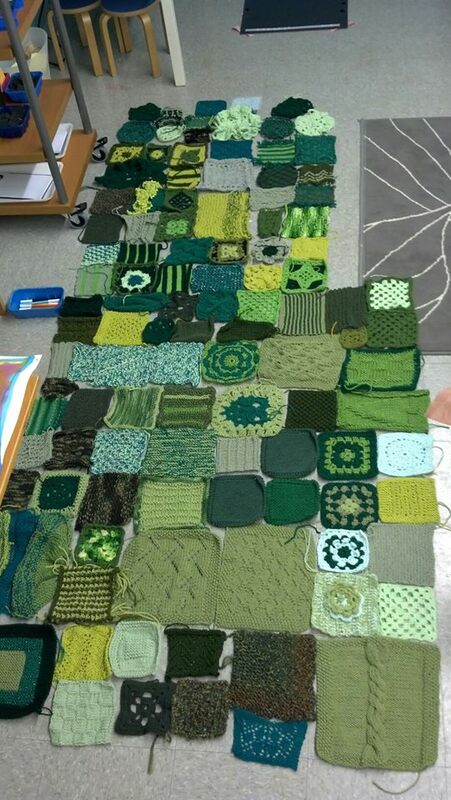 They collect reusable items that are used for arts and crafts and learning opportunities. In their store, they make the items available to the public at affordable prices. They sell fabrics and sewing notions, various papers and boards, wood bits, office supplies, and artists supplies. UpCycle also has a studio space where anyone can come to use their tools and supplies. They host classes and workshops to use their reuse collection for unique art and exploratory experiences. 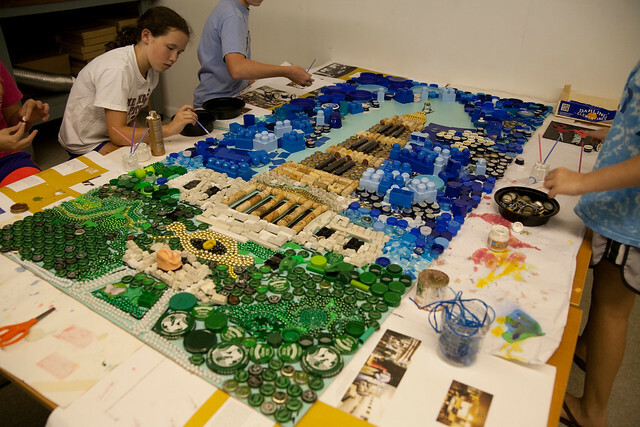 Every week, during the drop-in studio hours, anyone, young and old, can work on a project like this George Washington Masonic Temple mosaic, an installation they featured in the first few weeks. 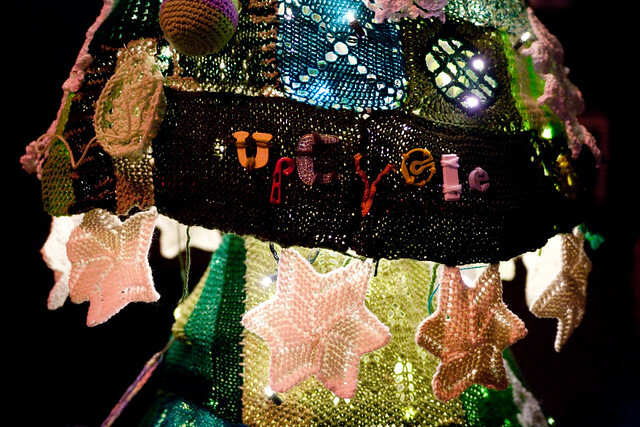 UpCycle has also teamed up with the Del Ray Yarn Bombers to create a public exhibit, a yarn bombed holiday tree, which is now on display on the Avenue to coincide with the Del Ray Business Association’s annual display. PRIZE: One (1) $25 gift card to UpCycle CRC. It can be used toward materials and/or drop-in studio time. DEADLINE: Monday, December 9, 5pm EST. PRIZE REDEEMABLE: Gift card can be picked up at UpCycle CRC, located at 1712 Mt. Vernon Avenue. This is such a unique place! I love that it is in my neighborhood. I would use the certificate to buy miscellaneous items for art projects. One reason we love upcycle is because my kids think this is the coolest place to go and they can be busy for hours, and it’s fun seeing friends there too! I love Upcycle. I shop here for materials for my art classes and camps at Huntley Meadows Park. I would use the gift certificate to purchase supplies for my winter nature sketch classes. Thanks DIY Delray! I’d love to stock up on some craft supplies or maybe save it for a playgroup class when my munchkin is old enough! I would buy supplies for my students and teach them about reusing! I would buy art/craft supplies for myself or even just use it towards the classes/workshops for my kids. I haven’t checked this place out yet, but I’m always in the market for some scrap fabric for sewing projects! We love UpCycle. Would use the certificate for my daughter’s birthday party, which we hope to have there early next year! I would use the gift card to buy supplies my kid’s school needs for an upcoming science activity. 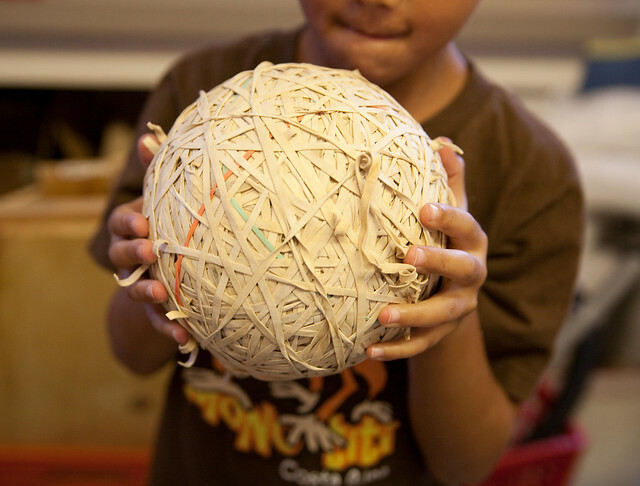 The Science teacher just sent home a wish list of items I know I can find at Upcycle. I love Upcycle because they always have what you need for any art project and they provide great ideas as well as space for group projects and drop in projects. If you haven’t been to Upcycle yet I urge you to go. My kids love to take classes with Kelley and Susan. The both are so kind and wildly creative! I really love what they are doing for my kids and for the community. Thank you UpCycle!!! If I won, I would use the gift card in the recycle shop or towards another class. UpCycle is a magical place. They have everything you need to make some cool stuff or to get inspiration for your next project. If I won I’d probably use the gift card in the shop (maybe sharing with my daughter if I’m feeling really generous!) or maybe towards a class. I love Upcycle’s studio! What a great addition to the Alexandria community! I would us the gift certificate to take my kids the open studio on Saturdays. Although I love the selection of unique recycled crafting supplies I think the most important thing about Upcycle is the warm exciting and accepting place they provide for child directed projects. They incorporate the highest ideals of art education into fun activities. I love this place. I would use the certificate for random interesting things for our rainy-day art projects. It is one of the most inspiring places that teaches so many wonderful things — including our environment and how things are made, using imagination and creativity, and the beauty of art. In a world where innovation is key — you two are making the next generation of inventors! My kids are so lucky to have the opportunity to explore, use their minds and really understand the beauty of innovation. THANK YOU. If I won, I would let my 9 year old roam around and watch her as she gets ideas for projects. This place is all about imaginiation. we love up cycle because it lets kids learn with their hands, teaches expression through art, and makes recycling cool and fun! We’d use the certificate to take a class there! I’ve heard so much about this place, and would love to explore all the craft accessories! With two small daughters, crafting is very relaxing.